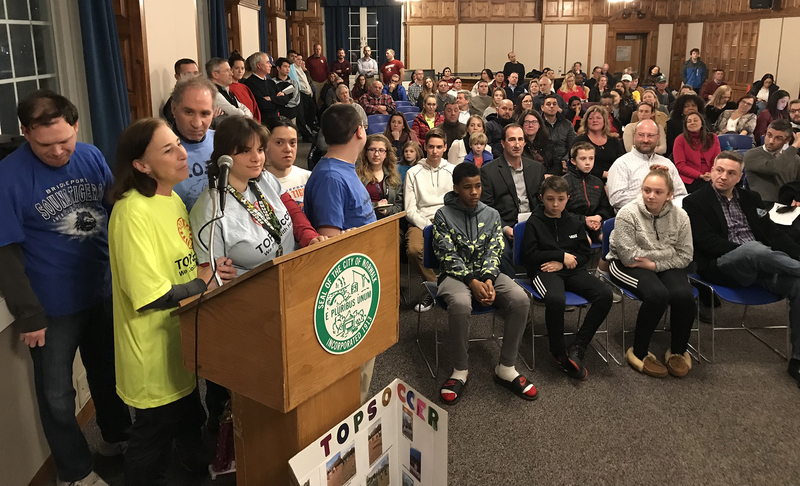 Dawn DiNoto speaks on behalf of her Norwalk Tops Soccer players, surrounding her, at Wednesday’s Planning Commission public hearing on the 2019-20 capital budget, in the City Hall community room. The Tracey Elementary School field is “not safe but we make the best of it,” she said. NORWALK, Conn. – The state of Norwalk’s athletic fields and schools brought an unusually robust crowd to Wednesday’s Planning Commission public hearing on the capital budget. Up to 100 people attended the Commission’s hearing, one of many steps in the process for the 2019-20 capital budget. At issue were requests for $45,000 for a feasibility study for softball fields, $2.2 million for a West Rocks Middle School soccer fields and $175,000 to install bathrooms at the Nathan Hale Athletic Complex, along with $9 million for Jefferson Elementary School, $100,000 for asbestos abatement at Rowayton Elementary and nearly $2.7 million for the facilities master plan, repairs at a variety of schools. Planning Commissioners noted the unusual nature of the crowd, given poor turnouts for capital budget hearings in previous years. “The current field inventory is falling significantly short of the demand,” Norwalk Junior Soccer Association President Bob Fosina said, echoing the athletic director’s comments that with Norwalk Public Schools working to change start times, the athletic field availability will be impacted. The softball field covered in water when other fields have drained, Neil Putterman said, and, “softball is the only field sport that does not have a turf option,” even though more than 300 girls play. Commissioner Nora King asked Acting Recreation and Parks Department Director Ken Hughes why the request was for a study, not a field, given the obvious need. The actual request to fund a new field will come next year, he said, leading Commissioner David Davidson to request a placeholder dollar figure to plug into the five-year capital budget plan. The study is new to the five-year plan. King said the City could factor in whatever estimate Hughes provides, “$1.5 million or whatever,” but Hughes was reluctant, given the variables. The new Nathan Hale Athletic Complex cost nearly $3 million, due to drainage and lighting issues, he said. Maria Basset said a youth field hockey league started in 2012 had grown from 60 player to 130, just in the last two years, and with that growth 200 players are expected. “Inventory is a problem and obviously the bathrooms at Nathan Hale,” she said. But Diane Lauricella spoke in opposition to some of the enthusiasm. There are health concerns with turf, she said, adding that Westport banned rubber infill on turf. Equity was a theme as Norwalk Public Schools made its presence known, dominating the second half of the three-hour long hearing. It’s a disgrace that the school hasn’t been renovated since 1970, she said. “With that said, they thrive. Because even though the situation is as dire as it is, the staff at that school is wonderful,” she said. “You have my 200 percent support on this school because it has been shocking what has been going on in my nine years of awareness of the situation there,” King said, to Brophy. NPS found out Wednesday that there’s asbestos in second floor classrooms, Principal Joe Rodriguez said, adding that an employee tripped on one of the aged area rugs and needed major surgery, and a new kindergarten pupil has begun to experience health issues, with the parent attributing it to the carpet. Rowayton kindergarten teachers Lisa Larusso and Mary Cambareri made an impression, with Larusso saying she remembers when the carpets were new and teachers were excited, but then they realized it was impossible to keep them sanitary. The asbestos dust is dispersed in the air, Cambareri said, asserting that a study done in 2000 showed that elementary school teachers were more than twice as likely to die of cancer. “Our present kindergarten students have experience escalated allergic outbreaks while sitting on the carpets and have to be moved to their chairs. There is no excuse for this,”Cambareri said. “The testimony from kindergarten teachers was the most powerful I have heard in a public hearing in a long time,” Commissioner Mike Mushak said. Late in the evening, the Cranbury parents made their presence known. “It boggles my mind that we don’t have window (air conditioning) units,” Young said. Norwalk Public Schools Chief Financial Officer Thomas Hamilton explained that it will be three years before permanent improvements are made at Cranbury. “Everybody is concerned, you wouldn’t have to work when it’s 112 degrees,” DiMeglio said. “These are multi-million dollar projects that require state approval before you can do anything,” Hamilton said, explaining that it’s not like flipping a switch. Board of Education member Barbara Meyer-Mitchell was the last person to take the lectern, explaining that the Board Facilities Committee has been looking at long-term and short-term solutions and the $500,000 that’s been requested is for window air conditioning units. The Commission will transmit its capital budget to Mayor Harry Rilling on March 4. Rilling then submits his capital budget recommendation to the Board of Estimate and Taxation, which will then submit a budget to the Common Council. Who can forget the old “fix it first” stunt. A plan hatched on a cocktail napkin over a weekend by the one person who has been sleeping in Hartford for 15 years while our wealth gets redistributed to leafy West Hartford and other legislative districts who actually have people standing up for them. Who needs the school facilities construction plan that includes new construction, renovations, maintenance and repairs of the entire system? Who needs a plan that had 1000s of man hours invested in it by professionals across all disciplines, when what was really important was a photo op to show how much you cared? It is unfortunate that so many of our children needs remain unmet. It is also especially frustrating considering the high property taxes we pay as well as the hundreds of millions we send to Hartford in income and sales tax. But this situation will not change and will further escalate as our school population outpaces our revenue growth until Norwalkers spend as much energy confronting the real problem as they do marching into city hall every budget cycle. The fundamental issue facing us is our lack of funding from the state. We are treated like a wealthy town instead of the urban city we really are. For the last 13 years our State Senator, also the State Senate Majority Leader, has been unable to provide the funding our kids need. Maybe next time, all the people who showed up last night should march on to Senator Duff’s house and make the same plea and then show up in his Hartford office. The problem rests with Mr. Duff, not the overburdened taxpayers in Norwalk. Norwalkers need to unify and demand action. Does Rowayton have a management plan like this article describes in place for their asbestos situation? My heart broke reading about what is going on in the school. It is no coincidence that several teachers there have died of lung cancer. Field improvements and adding more fields need take a back seat to this very serious asbestos health issue. Is there a plan of action and budget to take care of this?